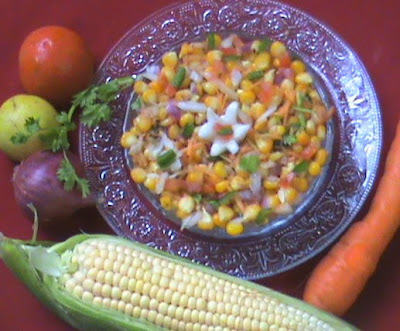 Cut corn into 2 pieces and boil it with salt. See to it corn is fully cooked and soft. Meanwhile, chop cucumber, tomato, onion, capsicum to fine pieces. Chop coriander leaves to fine sprinklings. Pluck the corn from the corn stick. 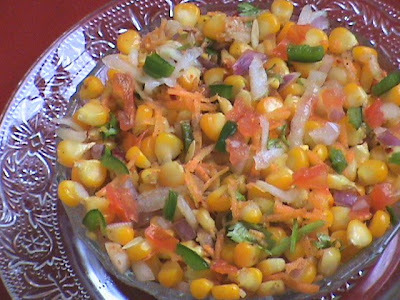 Take a small bowl, transfer the corn, cucumber, tomato, onion, carrot and combine it. To this add, red chilly pwd, chat masala pwd, butter, chopped coriander leaves, salt and mix them all. Add fresh lemon juice and combine. 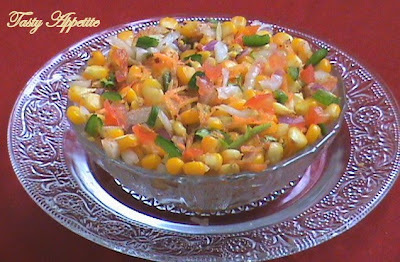 Tasty, healthy and colourful corn salad ready to serve.